To make a Christmas card, you will need: red, green, yellow, and blue crayons, pencils, or markers; scissors; glue; and an 8 1/2 x 11-inch (22 x 28-cm) piece of heavy paper. Color the stained glass window using the following key: 1 = red, 2 = green, 3 = yellow, 4 = blue. Cut out the window. Glue it to the heavy paper, leaving room at the bottom to write a message and sign your card. 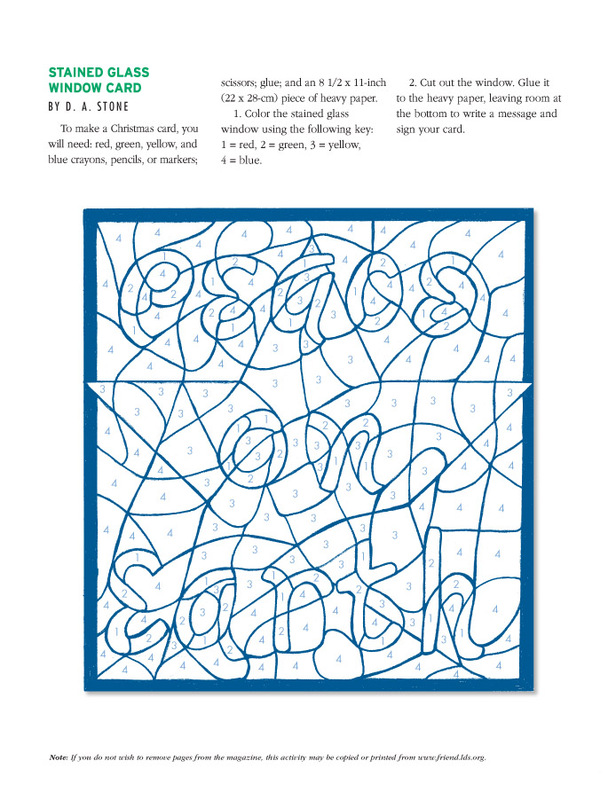 Note: If you do not wish to remove pages from the magazine, this activity may be copied or printed from www.friend.lds.org. Place 2 tablespoons of the milk and all the butterscotch chips in a saucepan. Stirring frequently, cook over low heat until the chips are melted. Add whipped cream or marshmallow cream if desired. Follow the package directions to cook the green beans, then drain. Drizzle the honey over the green beans, add the cranberries, and gently toss. Chop the chocolate into fine pieces. Place the pieces in a medium-sized bowl. Pour the cream into a small saucepan and bring to a full boil over low heat. Add the cream to the chocolate pieces, cover the bowl with aluminum foil, and let stand 5 minutes. Use a wire whisk to blend the mixture until smooth. Mix in the vanilla. Gently press plastic wrap on the surface of the chocolate. Refrigerate until the chocolate is firm but not hard, about 30–60 minutes. Cover a cookie sheet with waxed paper. Make individual 1/2-inch balls by rolling a teaspoonful of the mixture in the palms of your hands. (Cold hands work best.) Place the balls on the waxed paper. Roll the balls in the powdered sugar. Store in the refrigerator. Makes about 24.